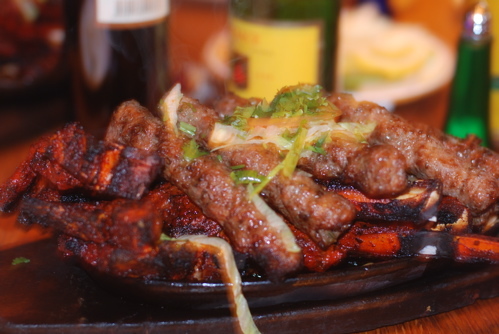 Food and Drink in London: Tayyab-adabadoo! Last night was the annual Christmas party for the UK chapter of the OA forum, a group of (usually) like-minded individuals who are Opinionated About food. It was great to be able to put faces, and in some cases names, to some of the growing population of food bloggers, and it proved to be a very special evening. This year's venue was Tayyabs (do check out the mad website – strangely appropriate), the well established Pakistani restaurant in Whitechapel. Unfogivably, this was my first visit. It certainly won't be my last. The restaurant itself is smart and modern, plenty of neon and pale, laminated furnishings. Unless you get there early, though, this won't make much of an impression: once it's full (and I'm sure it is every night) it's a case of heaving, semi-organised chaos, noisy and bustling, but with lots of happy faces. When the food arrives it's easy to see why. We were actually in the private dining room (the VIP area, if you please) which means I can't comment on the general service or the rudeness or otherwise of the staff, one of the qualities the restaurant is supposed to be famous for. I can, however, talk forever about the other thing that people always mention when talking about Tayyabs: the lamb chops. These are fantastic, deeply marinated with powerful spices, lovingly grilled and served fajita-style on a sizzling skillet with sweet onions. With long, sticky bones protruding, there's only one way to eat them – finger licking stuff. The koftas we had with them were, if anything, even better, packed full of fresh flavour. All in all it was amazingly difficult not to stuff yourself silly on these goodies, but were under strict instructions to leave room for the main course that were being prepared specially for us. So three or four chops had to be enough this time. We knew were going to be well looked after very early on when the first of the special dishes arrived, a bowl of raita that you won't find on Tayyabs' (or probably any other) menu. It was full of delicious gram flour dumplings, and was apparently supposed to accompany the lamb chops. A nice theory, but in the end the temptation proved too strong, and most of the bowl on our table disappeared with the poppadoms. 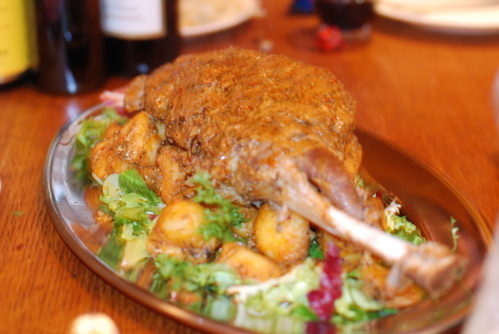 The real star, though, was the raan, a spectacular leg of lamb, clearly very slowly cooked, falling off the bone and packed with flavour. A second dish of beef shin, complete with bones to chew, was also slow cooked and an absolute treat, bursting with fresh coriander. Juiciness was supplied in the form of a great dhal. Special naans and chapatis wrapped everything up nicely. Dessert was a bit unnecessary after all this but some appeared anyway. A little sweet for my taste, some of it, but well complemented by some first rate ice cream. Tayyabs is dry, so come prepared with a few tinnies of your own, and is almost embarrassingly cheap. Even with the special treatment they'd lavished on our meal we only paid £24 a head; in the restaurant proper you'd be doing well to break £15. In the middle of a bit of a week for eating out, this was a real treat. Thanks to everyone who made it possible, especially Secret Santa, who provided me with foie gras AND a jar a goose fat, and of course to Wasim and the team at Tayyabs. Most people there last night had been to Tayyabs before. Everyone will be going again.